If you look at the commonalities among some of the world’s most successful people, you’ll find something striking: all of them read. In fact, they read a lot. Imagine Winfrey, Zuckerberg, Gates, Buffett…reading stacks on stacks of books. Not simply just to be entertained. To be educated. In fact, the higher level of education someone has achieved, the more they read. How many books one reads also correlates to income, as seen in this study by Pew Research. So, because we believe in helping create successful transitions and even more successful long-term civilian careers afterward, we’ve decided to create a book club—just for the RECON Community. Now, this ain’t your momma’s book club; there’s no wine or listening to Chatty Cathy mope on about how Chapter 4 reminded her of her childhood. Just a lot of great books, great thoughts, and great discussion among friends. 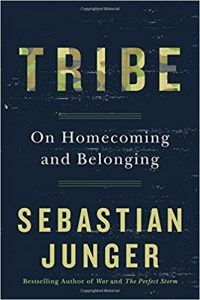 I hope you’ll join us as we kick off this group on Feburary 15 with Tribe: On Homecoming and Belonging by Sebastian Junger. Send us a quick email that you’re participating. This will help us keep in touch for announcements and future group mentions. Join the online discussion group on Facebook. There’s a link there to buy the book, if you need it.